Seeding small changes can pay off in great transformations over time. This article is drawn from a new case study by the Metropolitan Area Planning Council and the Congress for the New Urbanism, Reclaiming the Strip Mall: A Common Suburban Form, Transformed, by Christopher Kuschel. Download now. 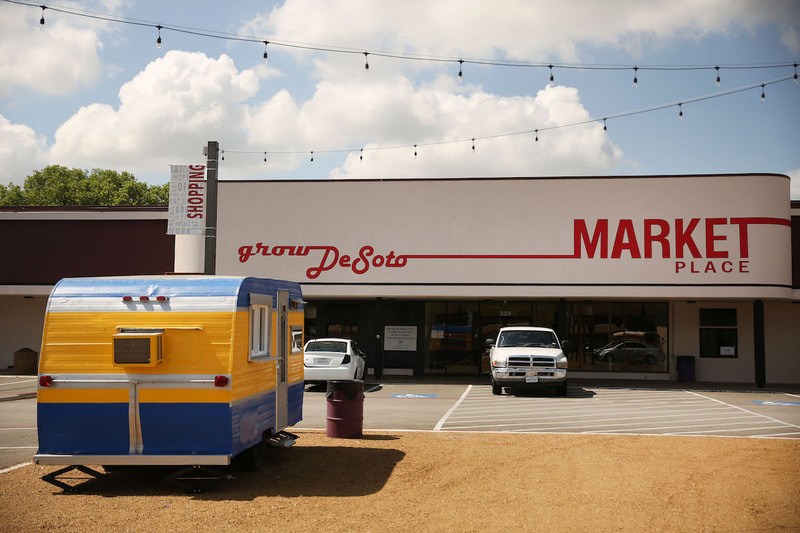 The new DeSoto Marketplace in suburban DeSoto, Texas, is a reminder that suburbs don’t need to wait for grand schemes or broad-scale retrofit plans to make changes to their communities. Sometimes a thoughtful, incremental, and locally oriented development approach at one site can show what’s possible and spark change. In 2016, developer Monte Anderson purchased the ailing Brookhollow Shopping Center in DeSoto, Texas, about 16 miles from downtown Dallas. His plans for the under-utilized strip mall were initially unambitious: find an inexpensive anchor tenant like a Dollar Store or the like, and let the mall coast on adequate performance, day to day. 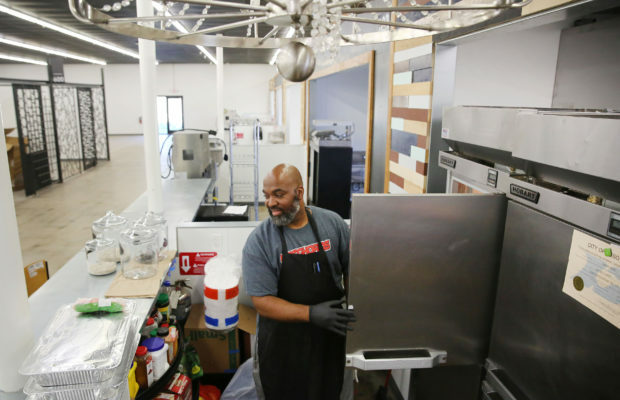 But DeSoto’s mayor asked for more, and Anderson engaged with the community to transform the site into a pocket of walkability and vibrant local business called DeSoto Marketplace. DeSoto is a first-ring suburb in Dallas County with a population of 50,000, about two-thirds of whom are African American, mostly middle-class. Although the community grew strongly in the 1970s and 1980s, it then experienced a downturn, increasing disinvestment, and pockets of poverty. Much of Brookhollow Shopping Center’s 50,000 square feet of retail space were vacant when Anderson took it on, including a 26,000-square-foot anchor space. Adjacent to an auto-body shop and gas station, and across from another suburban shopping center that was converted into a school, the site had limited walkability due to its location along a five-lane arterial that bisects the city east-west. Anderson’s development style is incremental, seeding small changes that can pay off in great transformations over time. With DeSoto’s weak market and the auto-centric nature of the site, he knew that the changes he made needed to be modest and cost-effective. A conventional view of the site valued the property at approximately $2.5 million. Anderson envisioned a development, which, based on his estimates of future net operating income, would value the property closer to $4 million. Rather than knock the building down and start from scratch, he worked from the inside out, adaptively reusing the building and site to foster walkability and serve as a hub for the community to gather. For example, he noticed that the site had far too much parking, and reclaimed some of the parking lot for additional uses, such as food trucks and trailers. Anderson also took the opportunity to add residential development along the edges. He built units to be affordable to employees working in the businesses on site. In 2017, Anderson invested in essential deferred maintenance and sought opportunities to bring in small, local businesses as tenants, holding a Shark Tank-style “pitch day” where small businesses had the opportunity to pitch their businesses to a panel of five judges, one of whom was the mayor, who strongly supported the redevelopment effort. Among the “winners” to set up shop included a small bakery, a soul food shop, a vegan juice shop, two attorneys with a high-end shoe product, and an 11-year-old snow cone entrepreneur. As the development went forward, Anderson was able to tailor it to the needs of these young businesses, very much in a spirit of “meet you where you are.” He and his architect modified the interior floor plan dozens of times, based on feedback and conversations with the prospective tenants. Part of these discussions focused on what the tenants could afford and figuring out how to meet their needs within their financial constraints. In less than two years from purchase to opening, Brookhollow had been transformed into the DeSoto Marketplace, with residential choices on site and a “pedestrianized” parking lot. Much of the exterior of the building is lined with counter-service eating establishments. The interior of the shopping center contains a variety of retail and office uses of varying sizes. On the east side of the lot are the residences. These weren’t placed along the roadway in front of the shopping center, so that they would not block view lines from the road to the tenants. The residences consisted of five small four-plex buildings. All of the units are loft-style one bedrooms of 700-800 square feet. This is the first such example of mixed-use development in DeSoto in recent years–and likely, it is by no means the last.